At Phillips contemporary evening sale in New York last night (15 November), gasps were heard as its star lot, a small drip painting by Jackson Pollock and sold without a guarantee, failed to find a buyer at $17.5m (est $18m-$25m). But in a week full of sales where several top lots bought in at both Christie’s and Sotheby’s, the auction house was in good company. By and large it proved a patchy week of bidding across the city regardless of the sale venue. Bonhams, too, had a few sale highlights that went unsold such as Max Liebermann’s portrait of the German-Jewish collector Robert Neumann (1925), estimated to fetch $50,000-$70,000 in its Impressionist and Modern art sale (13 November), which realised a 75% sell-through rate over all. Léonard Tsuguharu Foujita’s oil painting Fillette aux perruches (1957) led the sale, selling over the phone for $492,500 (with fees), but still below its high estimate of $500,000 despite the fact that the auction house set the record for the Japanese-French artist last month in London. The house's post-war and contemporary evening sale (14 November) netted $3.9m (with fees), just over its $3.8m low estimate for the evening but with only 64% of its lots sold. Even with a stronger command of contemporary art compared to Bonhams—one that has edged in on Christie's and Sotheby's hold on the market over the past several years—Phillips struggled to meet its mark. With an average 82% sell-through rate by lot, its 20th century and contemporary art realised $88.5m (with fees) of its pre-sale estimate of more than $100m, a figure it has sailed past easily in its past two fall sales. This may have been due in part to the withdrawal of one and the buy-in of another work by David Hockney, who later became the most expensive living artist that same night at Christie's evening sale. But there were other last minute withdrawals from the sale and the bigger lots that flopped didn't help. Pollock’s No. 16 (1950) was already a fraught lot before it fizzled on the auction block. It was deaccessioned from the collection of the Rio de Janeiro’s Museum of Modern Art (MAM) and first garnered attention in March this year, when the Brazilian Institute of Museums, among other leading cultural institutions in the country, criticised MAM for selling off the only Pollock on public view in Brazil. The museum contested that the sale of the work, which was estimated to make in the region of $18m-$25m, would cover its operating costs for at least three decades. The painting was donated to the museum in 1954 by Nelson Rockefeller. In a statement to The Art Newspaper, a Phillips spokesperson says the painting “failed to reach its predetermined reserve price, but we much believe in this masterwork", adding that the house intends to find a buyer privately "so the museum can continue its important mission of preserving its 16,000 works and expanding its collection of Modern and contemporary Brazilian art”. At Bonhams, two highlight paintings in its post-war and contemporary sale by the French Art Brut artist Jean Dubuffet failed to find buyers. The textured abstract works, Mangeur à la fourchette (est $250,000-$350,000) and Le Ravin (est $100,000-$150,000), were both made in 1952, during a decade that is considered seminal in Dubuffet’s career. Yet they are less colourful than his paintings from the 1960s, which have made the artist’s top four auction records. Phillips can be credited with some important new artist records, which wouldn't have been achieved without pushing the envelope. Foremost is a new record for the Cuban centenarian hard-edge painter Carmen Herrera; her Blanco y Verde (1966) for $2.2m ($2.65m with fees), which more than doubled her previous auction record of $1.2m at Phillips. 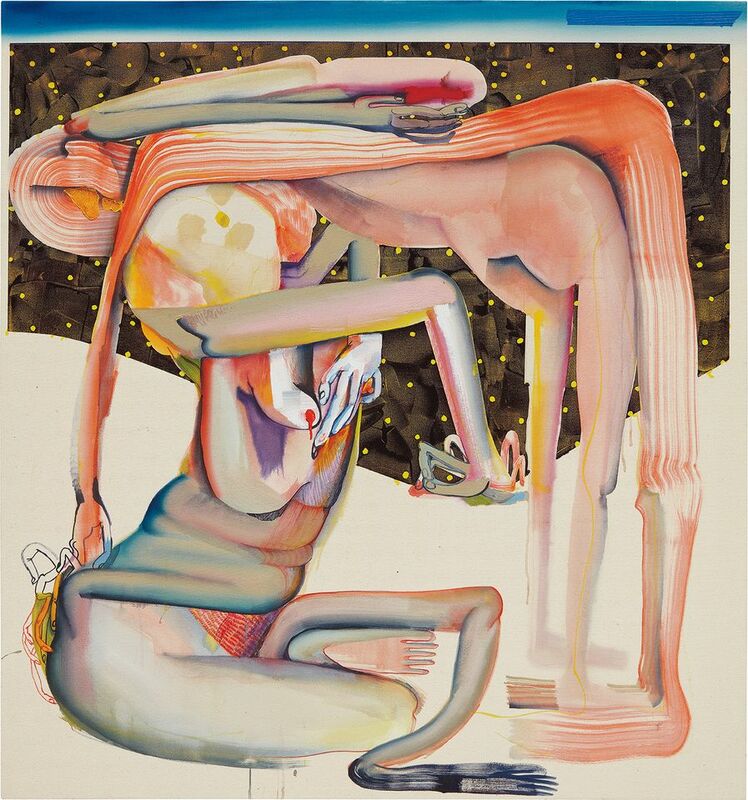 Pull on Thru Tha Nite (2017), the first work by the Los Angeles-based painter Christina Quarles to be offered at auction, blew by it its $30,000-$50,000 estimate, selling for $180,000 ($225,000 with fees), reflecting the artist’s meteoric rise since her first solo exhibition in 2017. Her recent institutional visibility likely played no small part in driving up the price, either. Earlier this year, Quarles’s work was included in the New Museum’s exhibition Trigger: Gender as a Tool and a Weapon and the Hammer Museum’s biennial exhibition Made in LA; she currently has a solo exhibition at the Berkeley Museum of Art. 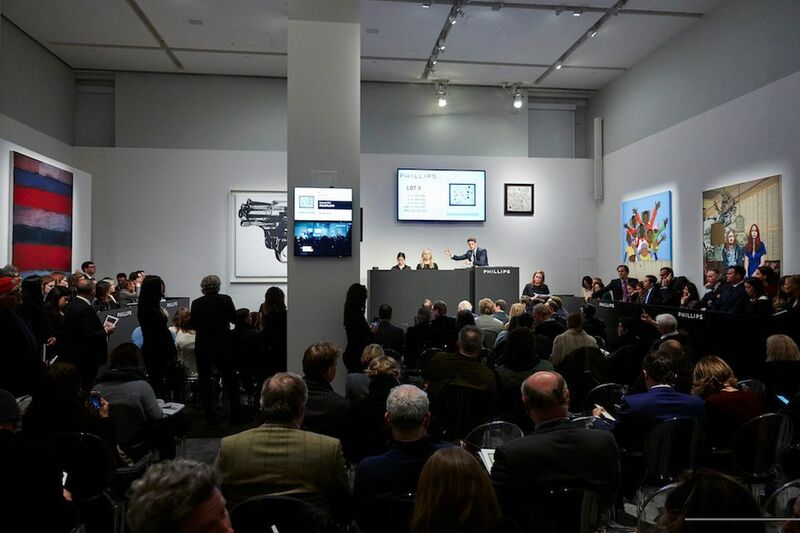 The auction house also set a new record for the American street artist Kaws, whose acrylic painting Untitled (Fatal Group, 2004) sold for $2.7m ($2.9m with fees), well over its $900,000 high estimate; later in the evening a painting by the artist also sold at Christies for $2.4m including fees, quadrupling its high estimate. Strong sales also rolled in for abstract painter Amy Sillman, whose oil painting U (2008) fetched $855,000, and the French sculptor Henri Laurens’s white marble work La Lune (1946) took in $2.1m, with fees. 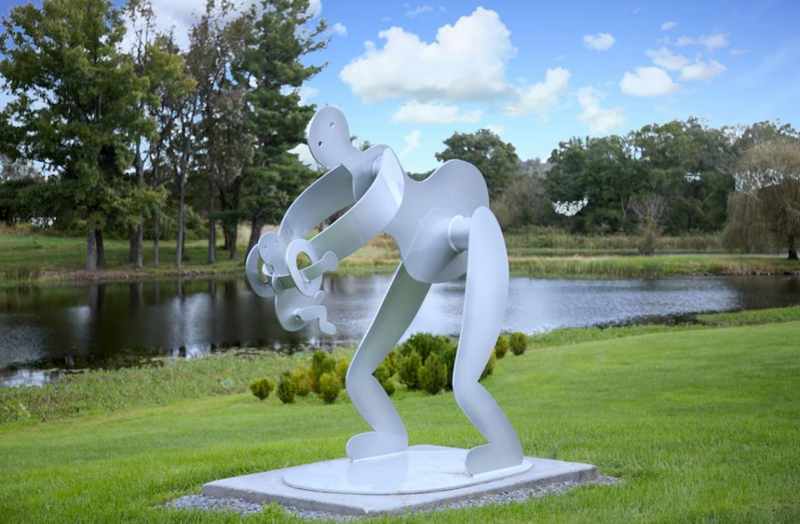 The star lot of Bonhams contemporary evening sale was Keith Haring’s monolithic aluminium sculpture Mother and Child (1986), the first edition of just three and one of the few large-scale sculptures the artist created in his career. The work doubled its estimate of $600,000-800,000, realizing $1m ($1.3m with fees). A vibrant oil painting, Bird (1965), by British artist Frank Bowling was fresh to market and sold for $80,000 ($100,000 with fees), tripling its high estimate. Jeremy Goldsmith, the auction house’s vice president and director of the Americas post-war and contemporary art department, says there’s been “a steady uptick in Bowling’s market, particularly with his upcoming retrospective at the Tate Modern”, which opens in March of next year. Last year, Swann Galleries in New York made the record for the artist with a larger acrylic painting that made $161,000 (est $60,000-$90,000). The sale also offered some quirky pieces such as an early brass wire hair comb by Alexander Calder made in the mid-1950s, which unfortunately sold for half its low estimate at $16,250 (with fees). The artist’s Red, Black and Blue (1968), a maquette for a mobile commissioned by American Airlines in Dallas, sold for just over its estimate at $552,500 (with fees). Perhaps the lots could have fared better if they had been offered after two Calder mobiles raked in more than $27m (with fees) at Christie’s contemporary sale the following night.